We are redesigning our current Police ID's, finally going to a updated digital one. Does any one here have any LEOSA (HR218) wording on theirs? Anything like LEOSA Compliant...etc. "CCW APPROVED HR 218 QUALIFIED" in Bold letters front of card, Weapon qual date Rear of card. Last edited by BTDT2; 07-09-2016, 10:37 PM. 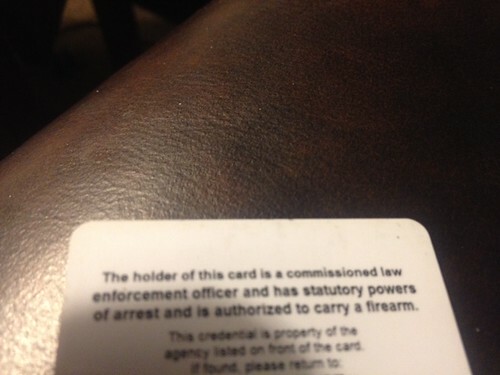 Ours just says "The bearer of this card has law enforcement authority and power of arrest". This card identifies the issued holder as a Peace Officer pursuant to Section 830.1 of the California Penal Code. This person is an active law enforcement officer as defined in 18 U.S.C. Â§926B and fulfills the statutory requirements of 18 U.S.C. Â§926B(c) and may possess a concealed firearm in all States pursuant to the Law Enforcement Public Safety Act of 2004. In order to meet the annual qualification requirement, my ID is valid for only one year at a time. My comments are my personal opinion and are based on my life experiences and training. They are not to be construed as legal advice in any form as I am not an attorney. Should you act on any of the information I provide in my comments, you do so at your own risk!! I think the wording could be better on my "Certificate of Proficiency" card that I carry along with my "Retired Officer" ID card. The COP card states on the front ".......(my name) Has successfully completed a course of fire as required by Texas Penal Code 46.15 and United States Code, Title 18, Chapter 44 for the concealed carry of a handgun by a retired law enforcement officer." I can't remember details at this second but when I looked at the requirements, our card's wording could have been better as per the law. My retired identification card looks just like an active officer's ID except after my name it says Retired, in red letters. On the back, along with my thumb print, the department's phone number is listed along with my physical description and the card's issued and expiration dates. I, (Chief of Police's name),Chief of Police, (City, county, state) hereby certify that (your name) is a qualified retired law enforcement officer with over ten years of service as a commissioned officer and has met the requirements to carry a weapon pursuant to United States Code, Title 18, Part 1, Chapter 44, Section 926C. One concern I have, and all of you Retiree's should be aware of is LEOSA does NOT have an exemption for carry on school grounds ("Gun Free School Zone") and unless your state has an exemption, you can't carry on school grounds. Here in CA, we do have a state law that exempts Retired LE from the GFSZ law, but your ID needs to include the State Law Section. If your "Retired" ID is pure LEOSA, you grandparents picking up or dropping off grandkids at school or attending a school event, you are NOT permitted to carry a firearm on school grounds, and you are in violation of the Federal Gun Free School Zone Act! I haven't looked into that issue if I travel out of Texas, but i will have no problem while in Texas due to the non-applicable status of me being an honorably retired law enforcement officer per Texas Penal Code 46.15. My wife is a teacher so I carry at her school as well as at both schools my daughters attend-Texas State Universty and Texas A&M. That's one of the hiccups the NRA page mentions. I don't know that anyone's ever been busted for carrying on LEOSA within 1000 yards of a school, especially since the feds would have to do it, but if you look at a map of San Fransisco for example and draw 1000 yard circles around every school property you cover most of downtown SF. I think it's kind of like carrying in a post office. Nobody cares unless you stir up some poop. San Fransisco map showing areas within a 1000 ft of schools. With most of SF within a gun free zone, I asked a retired SF street cop why not enforce GFZâ€™s it to rid the streets of gang members carrying a firearm, he said theyâ€™ve never caught a gang member who made it past the 5th grade within 1000 feet of a school. There are currently 5776 users online. 210 members and 5566 guests.